“Wind speed may reach 35km/hr in coastal areas and 38km/hr in internal areas,” he said. 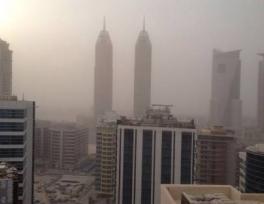 Drivers were advised to take extra care on Sunday as a major dust storm shrouded the landscape in a veil of white sand reducing visibility across the country. The National Centre of Meteorology and Seismology (NCMS) asked motorists to slow down and warned seafarers of rough waters in the Arabian Gulf and the Sea of Oman. The centre said the forecast for Monday called for partly cloudy, hazy conditions over eastern areas with a rise in humidity during early morning times over some areas. 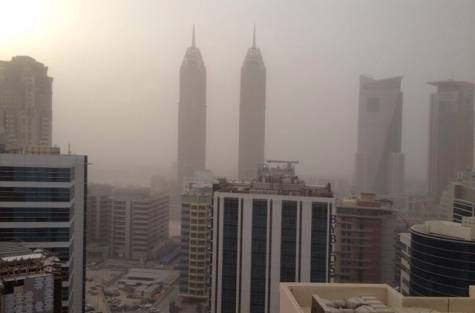 “Moderate winds may also freshen at times, causing blowing dust, haze and sand over internal and open areas. Sea is moderate to rough in the Arabian Gulf and the Sea of Oman,” a forecaster said. The centre said that temperature is likely to increase gradually with light to moderately rough winds across the UAE with a chance of rain. Residents were surprised at the twists and turns in the country’s weather as it turned from bad to worse on Sunday and traffic slowed to a crawl as workers made the slow commute home late in the day. “I have waited for one hour to wash my car during my lunch break. Two hours later, you want to kill yourself when you find a layer of sand covering your car,” Rana Alaa, a resident of Abu Dhabi, told Gulf News. Construction site activities were halted due to bad weather conditions. “The weather is cloudy, sandy and visibility is very low. So all construction site activities have been halted because the conditions are not suitable for workers to be in as they might be exposed to harmful particles of sand that they might inhale or that can go into their eyes and cause them future health problems. Work will commence tomorrow morning and overtime has been cancelled for today,” A.H, a construction manager at Saadiyat Island, told Gulf News. The National Emergency Crisis and Disaster Management Authority (NCEMA) had earlier provided members of the public with general guidelines to follow when dealing with bad weather conditions in the UAE. While officials at the centre noted that it will be dealing with emergency situations using strategic partnerships, a certain number of precautions must be taken by individuals to avoid disasters. These include staying away from dangerous places and flooding channels, valleys and low-level regions and beaches and to refrain from going into open water and open areas during unstable weather conditions. Meanwhile, drivers on the road are advised to remain vigilant and on the lookout for any obstacles that can arise due to strong winds, such as tree branches and fallen signboards while avoiding speeding and turning on their fog-lights during dusty and foggy weather.